Potato Chips in a creamy, chocolaty truffle egg. Wonderful! Think Potato Chips. Think Truffles. Think they don't add up? Think again. 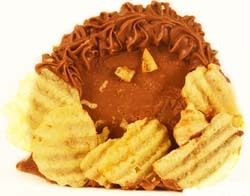 Note: picture shown is one-half egg with chocolate and potato chip ruffles added for display only.